I've been lurking for a while, joined a few weeks ago, and thought it might be nice to introduce myself. My wife and I are both wet shavers (though we tend to shave different areas). 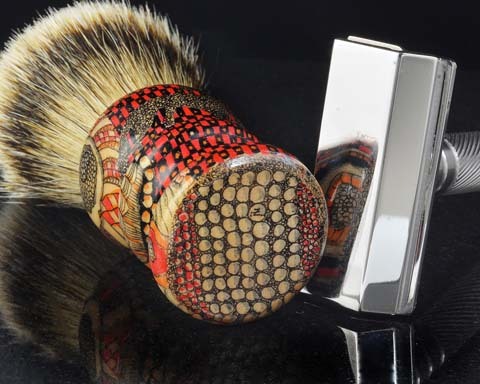 We have been having a great time exploring razors, soaps, aftershaves... you know, making it into a hobby. We are both woodturners, and primarily known for our jewelry. 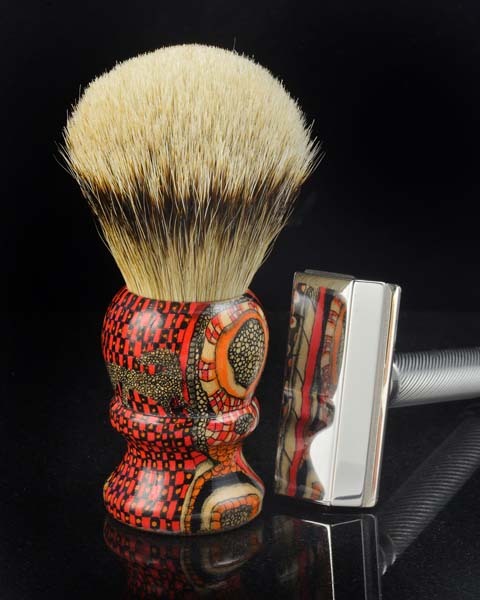 So collaborating on and making shaving brushes was a natural for us. 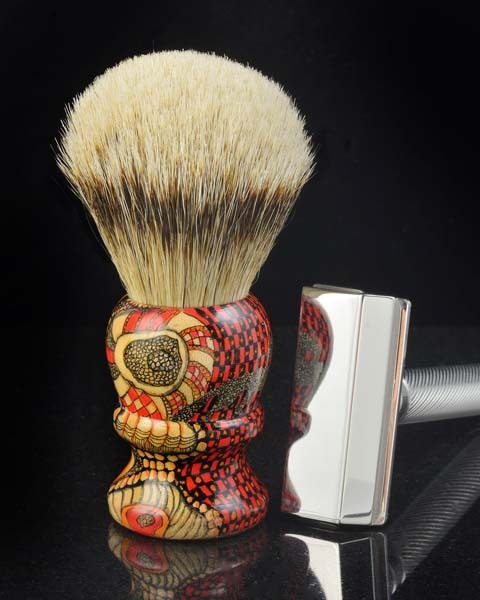 As an example, here are a few photos of a brush for my own shave den. We completed yesterday to commemorate the arrival of my Mongoose razor. The handle is hard maple, embellished with archival inks. I haven't determined the best way to post hi resolution photos (with better color and detail) in this forum, so for the moment, the smaller images will get us started. Welcome to The Shave Nook, Alan. I've never seen anything like that inking! Great brush. ..and Welcome to The Nook! Welcome Alan and Lauren, from an Indiana member. I thought it was covered with an exotic snake skin at first glance - really cool! Show us more of your work. Thanks for the welcome. I am hesitant to post photos of our work because it will take a while before we are eligible to apply for Artisan status. If the moderators say it's ok, I can post some examples of our work. 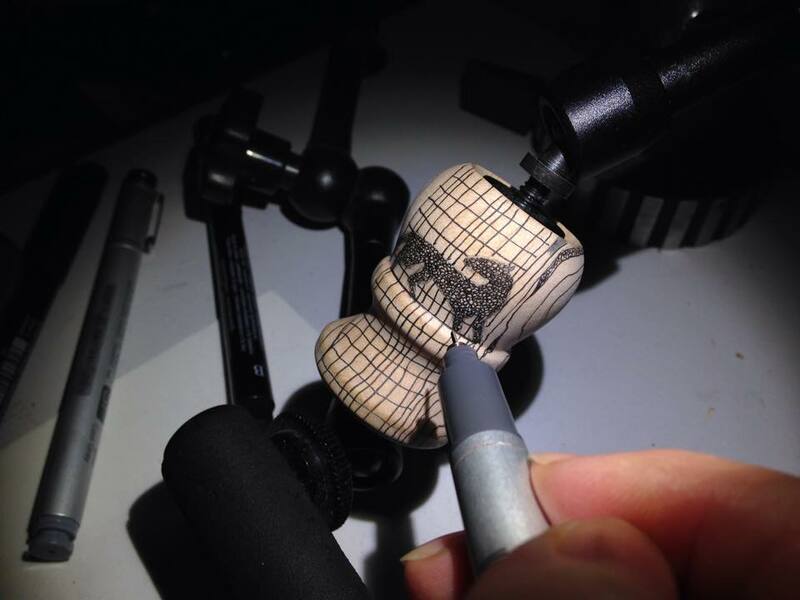 In the meantime, here's a photo of Lauren as she began the inking of this handle. Welcome to TSN! I belive I saw your work on Etsy and you did the art on the brush by hand? Beautiful work! I stop and admire from time to time. Welcome to the forum. That is one very appealing brush you've created. Freddie, I typically do the woodturning (though Lauren has her own lathe) and give it to Lauren for embellishment. I never quite know what she is going to come up with, but we do discuss it as it progresses and she takes my feedback into account. When she is done, I take the handle back into the shop for the finishing process. It's a lovely collaborative effort. Welcome to The Shave Nook Alan and Lauren and enjoy your stay. Welcome to the forum, Alan! Both of you produce some exceptionally beautiful handles! Thanks for all the kind words. At least this time Alan posted a photo showing my hand. He recently posted a photo of my lathered leg on another forum. Fantastic work! Love it. I'm looking forward to seeing more of your artistry. Welcome to TSN.